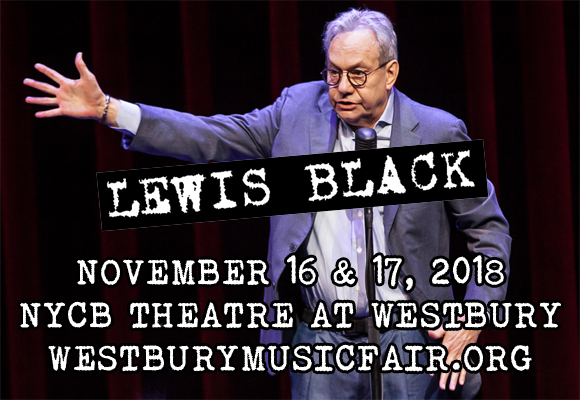 Comedian Lewis Black is angrier than ever, and he's coming to NYCB Theatre at Westbury on Saturday 17th November 2018! With the world in disarray, this Grammy Award-winning comic has no trouble finding material for his characteristic epic rants, so there's plenty to keep him going on this tour, named The Joke's On Us! Get ready to belly laugh as Black takes the world to task as only he can! American stand-up comedian, author, playwright, social critic and actor Lewis Black began his career in the theatre as a playwright. In the early 1990s, Black had the role of master of ceremonies as an opening act for his plays, which led to his career in stand-up comedy. In 1998, Black appeared in his first comedy special on the series Comedy Central Presents, and he went on to appear in two more episodes of the series in 2000 and 2002. 2002 also saw him starring in another Comedy Central special, Taxed Beyond Belief. An HBO stand-up special followed in 2004, called Black On Broadway. Throughout the years, Black has developed an angry and antagonistic stage persona, and covers a multitude of topics including politics, religion, history and popular culture, which are often tackled with bouts of profanity. He won a Grammy Award in 2007 for "Best Comedy Album" for his album The Carnegie Hall Performance, and the following year hosted the Comedy Central television series The Root of All Evil. He is also known for his regular appearances on The Daily Show with Trevor Noah, presenting his "Back in Black" commentary segment, which he has been doing since The Daily Show's Craig Kilborn era.